The pug is known as a small dog with a big personality. They were originally bred to be lapdogs and thus placed in the "toy" group. The pug is said to be larger than its own size because of its small but sturdy stature, it loves to be the center of attention, shows extreme confidence, is known for its sense of humor, and its longing for companionship and love from a human. 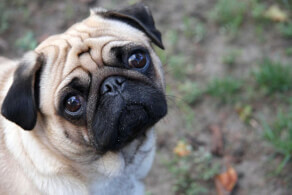 Pugs are known for their wrinkled faces and always having a smile which seems to never leave. Their looks along with personality to please and to entertain make pugs true clowns but clowns with confidence. In the distant past, Pugs were bred for duties such as watchdogs in monasteries and palaces. These days, these dogs are companion animals who have watchdog abilities but are too comfortable to watch out for invading armies and approaching dignitaries! They are great with kids, other dogs, and most non-canine pets. They are ideal for apartment living, and they are certainly not outside dogs. Pug snoring is just one of the many things you need to be prepared to endure. These dogs are demanding in many ways, and you should pamper them like kids who never really stop being toddlers. Will follow you ANYWHERE and EVERYWHERE! 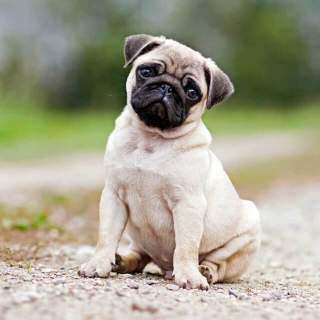 The pug is a small dog breed. They have small thick square bodies and a curly tail with a proportionally large round head with deep wrinkles and big "buggy" eyes. The pug has a short double coat which causes them to be heavy shedders. A small dog with a large personality. Pugs are known for their playful happy attitudes. They have the almost permanent smile to go along with that. Human interaction and being the center of attention is what makes a pug truly happy. With such a playful and fun demeanor, pugs love games. They require and thrive off of human interaction. Pugs are very loving and loyal but can also be stubborn if not trained correctly. Since they love attention, they can be trained to be very comfortable and friendly with other people, kids, and other people. Its confidence and curiosity also help with this. Through proper training, a pug though small, can make a nice watch dog. It is known to not have a "yappy" bark, keeping it a neighbor friendly dog. Being friendly, fun, playful, and entertaining, the pug makes a good dog for the family or as a single companion. Despite being stubborn, pugs with proper training, can become even a great watchdog. 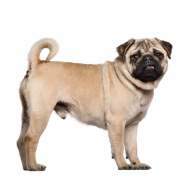 The pug is very calm and sociable making it a great dog with children and household pets. If there was ever a time these dogs were not literally treated like (or as) royalty, it has only been in the last century or so. Ancient Pugs were only allowed to be owned by Tibetan monasteries and family members of the Chinese imperial royalty. It was not uncommon for these dogs to have their own guards, palace and royal rankings. Attempts to steal these dogs were often punishable by death. The dogs were also sent as gifts to nobility and other persons of prime importance in Japan, Korea, and other nearby regions. When the Dutch East India Trading Company eventually became a trading power in the Far East, it was not uncommon for them to have these "Dutch Mastiffs" on board and taken back to Holland. From there, the dogs found their way throughout Europe and to England. Some Pugs made a name for themselves by acts of heroism. In 1572, Pompey, a Pug owned by the Dutch Prince of Orange, William the Silent, alerted his master to an impending attack by Spanish forces. When the wife of Napoleon Bonaparte, Josephine, was imprisoned, she used her Pug, Fortune, to secretly send messages to her husband. The William Hogarth Pug painting, produced in 1745, helped create a fascination for the dogs. 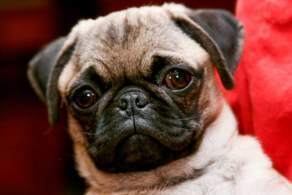 When the English successfully invaded China in 1860, Pugs were left behind in the royal palaces. These dogs were taken back to England and became even more popular than before. Queen Victoria's advocacy for the Pug breed was essential in the founding of the Kennel Club in 1873. 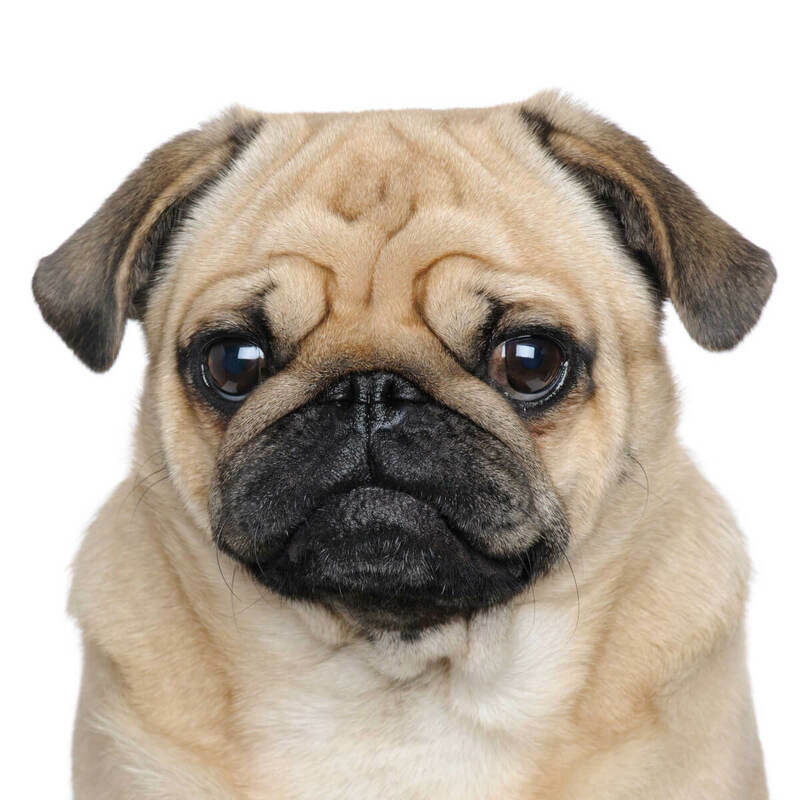 Pugs are small, compact dogs with a body like a little barrel, an effect that is heightened by the dog's flat, "pug" face. They have a relatively sturdy look if their legs are neither too short nor too long and they are not overweight. The Pug face is full of features known the world over. The wide mouth, the Pug ear, that cute Pug nose, those eyes and the wrinkles are all part of the package. The mouth seems to split the head in half when the dog is happy. The ears of a Pug may be the rose or button: the rose ears are smaller and the button ears fold flatly all the way down. Both styles sit high on the head, and between them is sometimes found a "thumbprint" in the forehead wrinkles. Pug skulls also tend to force bulging eyes, offer a sometimes lazy tongue and have a possible underbite. These dogs have a deep chest that actually gets bigger with age, and their square little body ends with a curly tail that should loop over the rear end. The Pug coat is short, smooth, shiny and dense, and it will feel much as it looks. 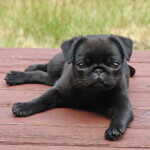 There are four Pug colors: apricot, black, fawn and silver. While most big kennel clubs (such as The Kennel Club and the FCI) recognize all four colors, the Canadian Kennel Club only recognizes fawn, silver and black, and the AKC allows only two: black and fawn. 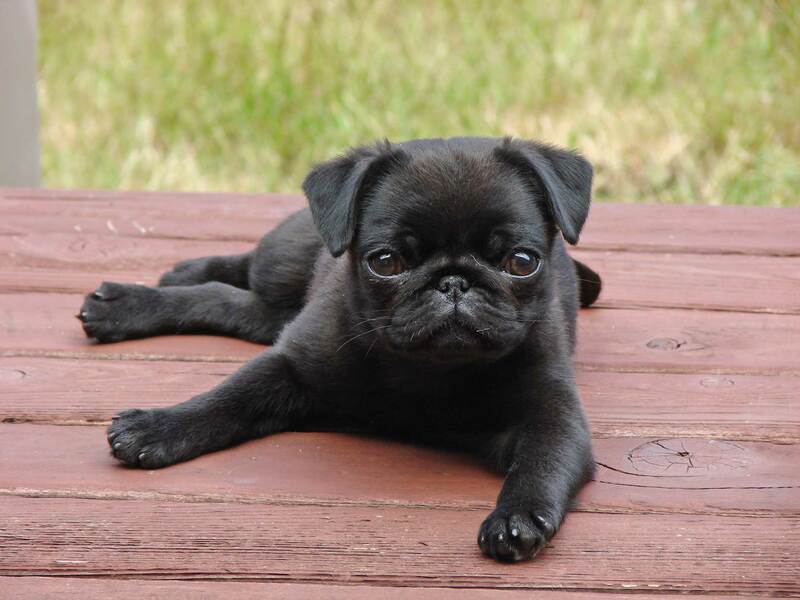 Black Pugs were considered incorrectly bred until the Victorian era when Queen Victoria and other noble ladies made them popular. The white Pug does not exist, apparently, and are said to not be purebred and most likely a mixed breed that combines French Bulldogs. There is, of course, the infrequent albino Pug. These dogs are not so much white as absent of pigment in their coat, lips, nose, eyes, etc. For males, the typical fully grown Pug weight should be 14 to 18 pounds. 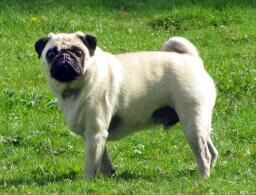 Female full grown Pugs are only a bit lighter at 13 to 18 pounds. The male Pug height is typically 12 to 14 inches and females are 10 to 12 inches. All Pugs can easily weigh more than this, however, if allowed to overeat. It's recommended that you have a Pug weight chart handy to monitor your dog's size. A fully grown Pug has a tendency to look heavier than they may be, and it's best to do more than a guess. There are no universally recognized variations of this breed, but there are many different types of pugs sold, titled and informally recognized. There are teacup Pugs which tend to be subtly crossbred or merely runts bred to make even smaller Pugs. There is the very rare and hotly debated long haired Pug that is either not entirely purebred or may have a recessed gene. There are the black Pugs which tend to have a single coat rather than the standard double coat. 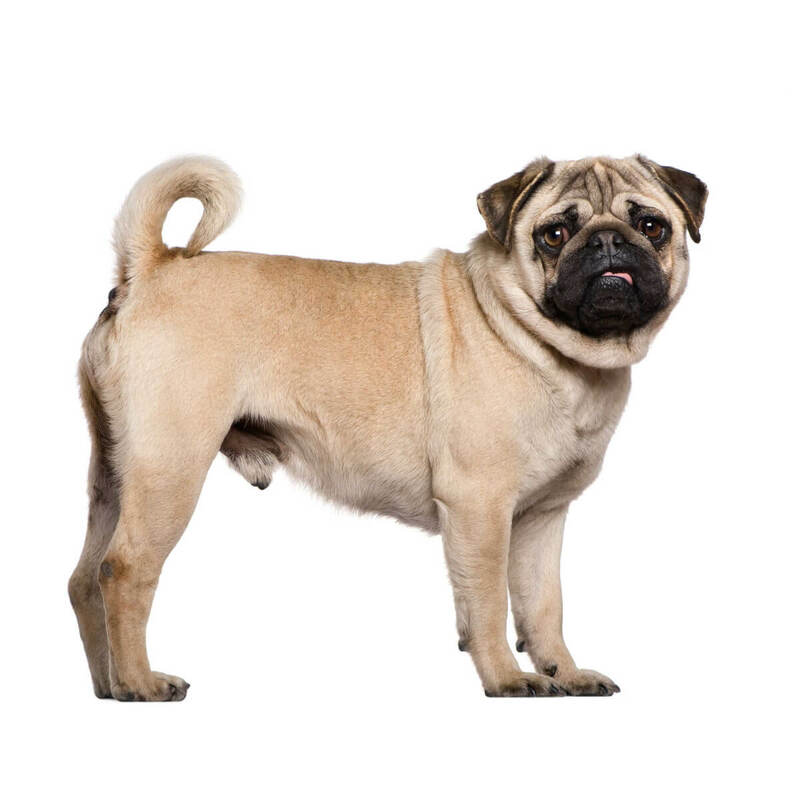 And long ago, there were the two distinct types of Pug based on coat color and which have long since been interbred so that these particular bloodlines are no longer distinct: the Morrison line and the Willoughby line. 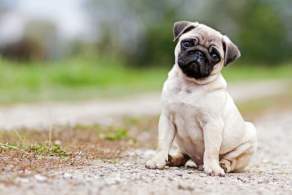 As for miniature Pugs, or pocket Pugs, or micro teacup Pugs or any other name implying a breed other than just "Pug," the AKC and the Pug Dog Club of America do not in any way recognize or endorse such dogs, and most people say these are cross-bred dogs. The Pug temperament is historically steeped in these dogs being pampered in most every way. They can be bossy, demanding and slightly "pugnacious" even as they are loyal, protective and clownish. They will watch out for you, bark to warn you, and expect to be treated royally. They can also be very jealous, especially of other pets, children who have your attention and anything that prevents them from being in your lap. Because they are almost always after food or attention, this can make for some strange Pug traits. You should be sure to train them gently, understand that they tend to be underfoot all the time, and will want to be with you anywhere and everywhere. They are not difficult to train, they don't respond well to harsh tones of voice, and they can quickly learn what will get them attention or food. 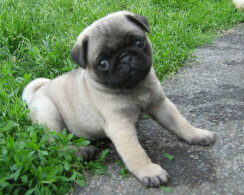 Despite their small size, the happy Pug personality depends on having a master who is calm and, most of all, confident. Owners who seem unsure of themselves regarding dogs will not get respect from Pugs. This can lead the dogs to be unusually protective of furniture, places, and food — against the owner and others. Pugs and kids may or may not get along. If your kids tend to keep you occupied and inattentive toward your Pug, the dog may respond with bad behavior. Children should be mature enough to understand that Pugs are not to be given food when they beg, are not to be handled roughly and should not be yelled at if they do decide to go after the food in a kid's hands. As for Pugs and babies, they should be supervised when around each other. Babies won't understand to not pull on tails or be able to protect things from being eaten (food, toys, fingers sticky with food). Pugs do not understand that just because something smells like food and is accessible, it should be eaten. For the most part, however, Pugs as family pets can get along well enough with children. When it comes to Pugs and cats, this can be a great combination — especially if they grow up together. Pugs tend to love cats, and while their curiosity may be annoying to older cats, they tend to patiently wait for cats to warm up to them. They are also prone to cozying up to bunnies. If you have a Pug and bunny as pets, you should expect them to be friends. With Pugs and other dogs, they can be good friends, but they must be socialized. They may bark at much larger dogs, and while those bigger dogs will humor them, they should be watched. If you have other dogs as pets, there may be jealousy when it comes to lap time. Pugs are insistent about having ownership of you lap whenever they so please. They must be gently and patiently taught to understand they should share. 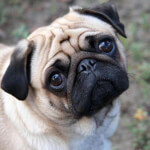 Below are pictures of the Pug dog breed. Owning a Pug as a pet means a moderate amount of daily responsibility. If you are wondering, Are pugs hypoallergenic?, the answer is No. Pugs shed a lot, and they shed everywhere. Some people will even get furniture that matches their Pug's coat color so as to lessen the visual effect of the non-stop shedding. When living with a Pug, you need to have a stable and reliable indoor temperature. If it gets very hot or cold, these dogs can quickly develop serious respiratory problems. You need to make sure you can keep your home cool in summer and warm in winter. This should be considered when thinking about the cost of owning a Pug. These dogs can't just "take the heat" or dress up warmly all the time. Barking is not much of a problem with Pugs, but if it is, there's usually a behavior problem at the root of it. It may be jealousy, it may be boredom — or it may be separation anxiety. Pugs are notorious for becoming anxious in your absence. There are many ways to deal with this, but the best way is to understand that if you are planning to frequently or regularly leave your Pug home alone, this may not be the dog for you. Frank the Pug is the sidekick in the blockbuster movie franchise, Men In Black. Around humans, he is a Pug; around other aliens, he takes on his "Remoolian" form. The Pug depiction was also in the animated series and video game based on the movies. The Pug saying, "What The Pug," is not just a saying for T-shirts but the actual name of a microbrewery in Bangkok, Thailand. Not related to that brew house is a beer named the Ugly Pug from a brewery out of Ft. Worth, Texas. The ugliest Pug seems to be a photographic delight to many people. There is even a photographer who specializes in finding them at ugly dog contests and elsewhere — and he frequently features ugly Pugs! Then there is Pugsly the Pug, a Beanie Baby that comes in two styles: the normal one and the "accidental" one. The normal one goes for a couple dollars, but a mint-condition "accidental" one with "deformities" and other errors tends to go for a few hundred dollars. Pugs have a fair amount of health problems, some of which are due to an intentionally bred feature that makes them so adorable: brachycephaly. This genetic aspect is what gives these dogs the flat face, bulging eyes, and small head. It also means these dogs must be kept in carefully regulated environments. Pugs can quickly get chills or heat stroke. This is due to the very short air passage that fails to allow air to cool down or warm up as it enters the lungs. A Pug's facial wrinkles and eyes must also be cared for constantly. Moisture in the wrinkle folds can promote fungal growth, and over-exertion can cause serious eye problems. Kept healthy, happy and properly fed, Pugs have an average lifespan of 12 to 15 years.